These new checkout51 offers will go live at 12:00 AM on Thursday, 02/19 and expire at 11:59 PM on Wednesday, 02/25. Members must buy the products in the United States and submit the receipts while the offers are live. Bananas, Any brand. Excludes frozen varieties. This is part of "Pick Your Own Offer"
Shout®, Any variety. 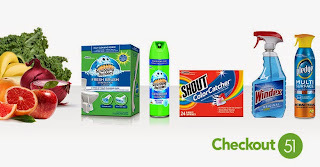 Excludes Shout® Free and Shout® Advanced products. Windex®, Any variety. Excludes Windex® Foaming Glass Cleaner and Windex® Electronics Wipes. Scrubbing Bubbles® Bathroom, Any variety. Excludes Scrubbing Bubbles® Toilet products. Scrubbing Bubbles® Toilet, Any variety. Excludes Scrubbing Bubbles® Bathroom products. Nature Valley™ Protein Granola bags, Any flavor. Excludes all varieties of Nature Valley™ bars. Soy Vay® Marinades & Dressings, Any variety. Suavitel® Fabric Conditioners 50 oz or larger, any variety. Suavitel® Dryer Sheets 40 count sheets or higher, any variety. Rumford Reduced Sodium Baking Powder 4 oz. and 8.1 oz. canisters. Clabber Girl All Natural Non-GMO Corn Starch 6.5 oz can. Colavita Extra Virgin Olive Oil 17 oz or larger, any variety. Fabuloso® cleaners 32 oz or larger, any variety. McCormick® Grill Mates® products, Any variety. Items must appear on the same receipt. Nongshim Meal Noodles, Any flavor. Excludes Bowl Noodles and Cup Noodles. Items must appear on the same receipt. Urban Accents® Spice Blends, Any variety. Offer not available for online purchases. Urban Accents® Dryglaze™ Grilling Rubs, Any variety. Offer not available for online purchases. Mrs. Renfro's Salsa, Any variety. Items must appear on the same receipt. Blue Dragon products, Any variety. Imagine® Chunky Style Soups, Any variety.